3/25/18: Leucadia Streetscape Moves Forward After 7 Years! In a milestone achievement at last week’s meeting, the City Council certified the environmental document (EIR) for Leucadia Streetscape, the city’s largest capital project, which will stretch along Coast Highway 101 from A Street north to La Costa Avenue. The vote was 4-to-1 in favor, with Mark Muir voting no. Construction is set to start by early next year, pending Coastal Commission approval. The City Council will be discussing alternatives for funding the project in one stage, instead of dragging it out for many years by building it in pieces. The project was initially approved by the City Council in 2010 but it appears that other priorities and controversies, including the construction of the Encinitas Community Park and purchase of the Pacific View school property, effectively supplanted the funding and attention needed to move Leucadia Streetscape forward. The majority of this City Council has identified transportation and mobility improvements citywide as a top priority, and Leucadia Streetscape is key to actualizing those transportation improvement goals. I recognize that it’s not possible to do a major infrastructure project that has the unanimous support of all residents. The nature of these projects is that some people will oppose them. But on balance, it appears to me that this long-delayed project has been extensively vetted and refined, and has broad based local support. It’s clearly needed in downtown Leucadia to reduce cut-through traffic from the freeway, returning the road to more local and less commuter use. My take is that Streetscape will create a safer, more pleasant environment for residents and visitors to bike and walk, while enhancing the unique atmosphere and charms of Leucadia’s increasingly vibrant business and residential community. The city heard the concerns about neighboring streets becoming congested and plans to address those concerns as well. We approved the Environmental Commission’s recommendation to draft a local ordinance requiring restaurants to provide plastic straws on request only. When I read this report from Commissioner Jim Wang, I was convinced. According to the National Park Service, Americans use 500 million plastic straws each day! I Love a Clean San Diego picked up 15,000 straws from local beaches in just one year. Commissioner Wang writes, “Plastic straws are luxuries that are unnecessary for most people. They are Single-Use Disposable Plastics that are convenient for a few minutes and are then discarded. Once in the environment, straws persist for decades, if not centuries. During that entire period they endanger wildlife, constitute unsightly litter, and release toxins. Their short-term benefit does not justify their long-term cost. The actual ordinance will return to us for approval. 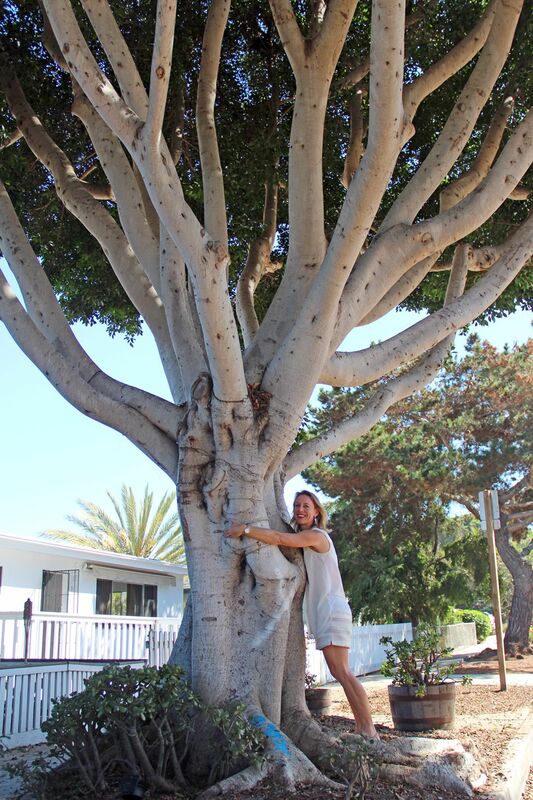 The 51 ficus trees downtown continue to be a source of contention, with some downtown business owners unhappy about the management of the trees and other local residents and pro-tree folks eager for a stronger commitment to these living Encinitas landmarks. We created a subcommittee of Councilmembers Tony Kranz and Mark Muir to work together with the tree committee, the downtown merchants’ association (E101), local residents and other interested parties to develop a more comprehensive downtown tree policy. I’m hopeful we can find our way toward a good neighbor policy with local business, while also supporting the existing trees. 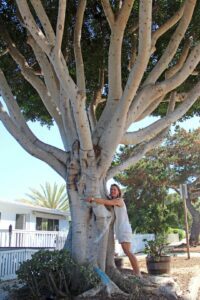 My preference is that we manage the ficus trees with appropriate and consistent pruning, more frequent removal of berries that accumulate on sidewalks, and focus our attention on filling the more than 70 vacant tree wells downtown. Having a lush tree canopy requires management like we’re already providing in our city parks. We’re capable of extending this botanical stewardship onto our public streets. 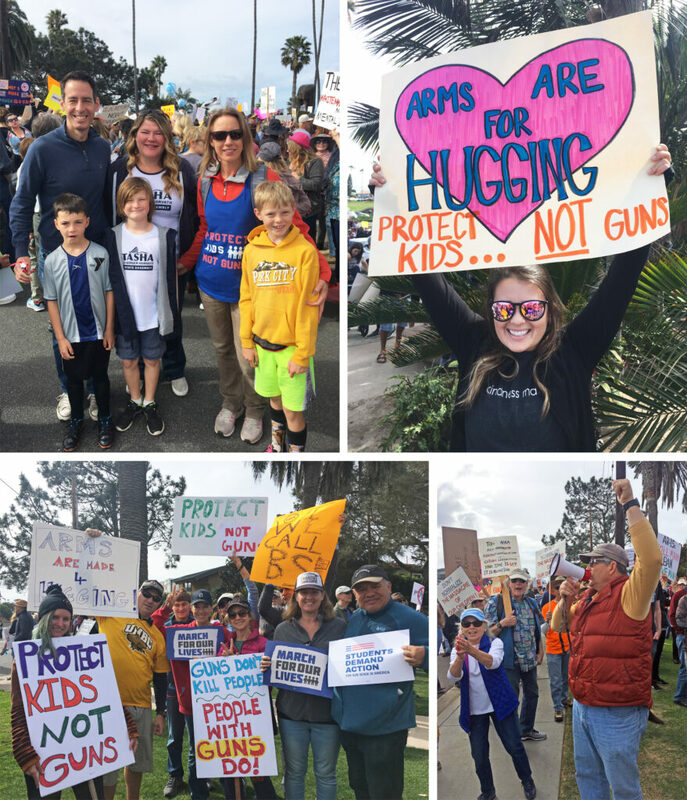 Yesterday morning at Swami’s, Deputy Mayor Joe Mosca, Councilmember Tasha Boerner-Horvath, Councilmember Tony Kranz and I joined several thousand proactive citizens as we added our voices to March For Our Lives and demanded stronger action against gun violence. The San Diego Union-Tribune story on the thousands who marched countywide captures the zeitgeist. As elected officials, we can amplify our residents’ voices demanding stronger controls on gun violence by demonstrating commitment at the local level, then sending it up the chain to congressional and state leaders. Four of five of your elected city officials supported this Gun Violence Prevention Resolution at last week’s Council meeting – Joe Mosca, Tony Kranz and Tasha Boerner Horvath, and me. Before voting against it, Councilmember Mark Muir asked me, in what I believe must have been a rhetorical question, what was meant by “dangerous weapon?” Here’s the Encinitas Advocate story. An estimated three million American children per year are exposed to shootings, and gun-related deaths are now the third leading cause of death for American children. Contemplating this type of violence to your very own children is simply unfathomable. Even witnessing shootings can have a devastating psychological impact. The Council majority also supported Del Mar, which last week passed a similar resolution. Del Mar is the home of the state fairgrounds, and its City Council is calling for gun shows to be discontinued there. We feel strongly that the State of California, which programs the shows at the fairgrounds, should not be in the business of promoting more guns and ammunition in our local community through shows that take place five times a year there. The board that runs the fairgrounds needs to place strong weight on the wishes of its host city, Del Mar. According to this article in the Coast News, no board member has requested to agendize board level discussion of the gun shows and few people come to their monthly meetings at the fairgrounds to discuss the gun shows. There’s nothing more powerful than showing up in person and requesting action. The board meeting dates and times are here. 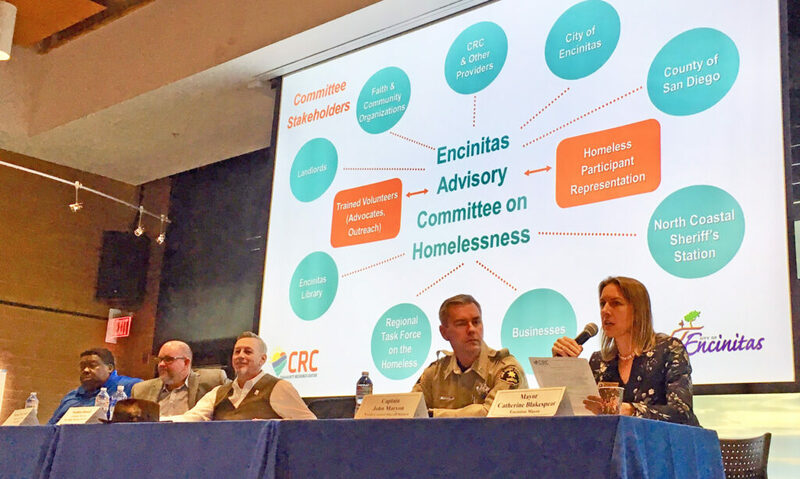 Last week I was honored to be included on a panel on homelessness hosted by the Community Resource Center in the Encinitas Library. Every seat was filled, a testament to the compassion and alarm many feel about people living on our streets. “The solution to homelessness is a home,” said Stephen Russell, executive director of San Diego Housing Federation. The 15-minute presentation from Mr. Russell was so clear and compelling that I’ve invited him to give it to the City Council and the community before our next housing meeting at 6:00 p.m. on Wednesday, April 4, at City Hall. I invite you to join us in person, or via our webcast! The Coast News article linked here nicely captures key details of the forum. 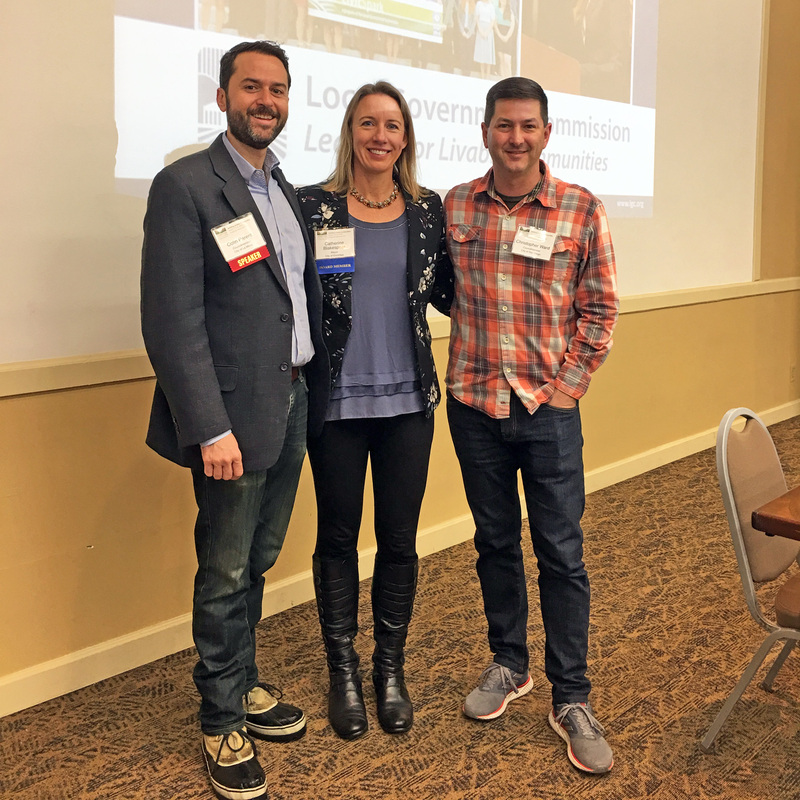 An additional housing update: As a board member for the Local Government Commission, I was delighted to moderate a panel on housing at the Yosemite conference last week. I interviewed the panelists on the phone beforehand to really understand their perspectives, which helps in my ongoing and evolving understanding of the many facets of housing policy. In the photo above, I’m with two outstanding local representatives whose mental processing and proactive engagement I much admire. On the left is La Mesa Councilmember Colin Parent and on the right is San Diego City Councilmember Chris Ward. Colin was on the panel and Chris participated as an audience member. Speaking of Yosemite, now’s a good time to share another photo! 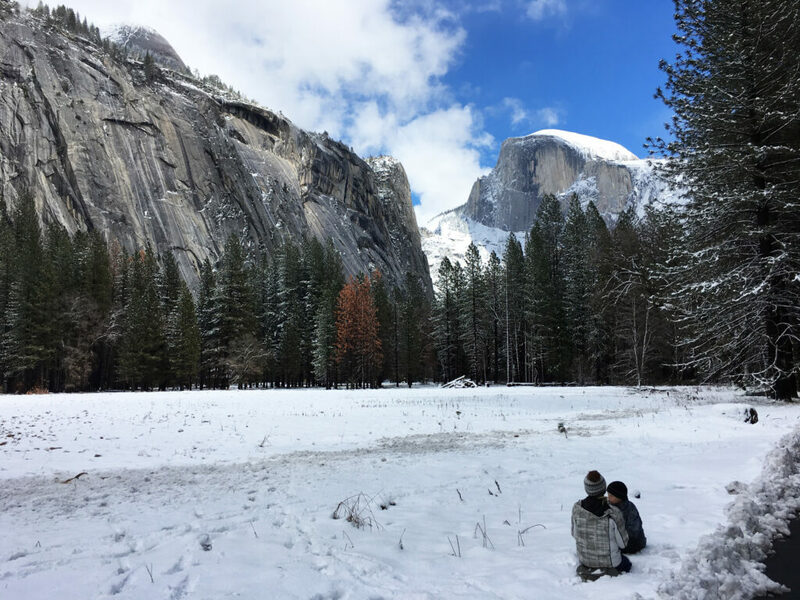 It was a snowy, beautiful weekend in the national park established in 1890. Yosemite is an incredible place that every American should visit! I’m delivering my second State of the City address at an event sponsored by the Encinitas Chamber of Commerce this Tuesday evening, March 27. It will be taped and posted online for the community to see. The Encinitas Senior and Community Center is the largest venue in Encinitas for public events like this, and every year the State of the City sells out. I wish we had a larger facility for more people to participate in person. Happily, technology can bring the content right into your own home for free. I’ll include that link in my next newsletter. – SANDAG Communications Manager Irene McCormack, referring to the newsletters I write to you. Previous Post3/18/18: Good News on Bike Sharing, Zero Emission Vehicles and Quieter TrainsNext Post4/1/18: The State of Our City is Strong!